Nancy, who lives close to the beautiful coast of Monterey Bay in California, has supported Save the Manatee Club for about 20 years. Every year she sends out manatee Christmas cards to her Lady Shriner friends, and she has adopted numerous manatees for family and friends. Note: A high resolution jpeg (300 dpi) of a manatee image, as well as a photo of Nancy Blessing-Walker, are available upon request. Thirty-four real living manatees are up for adoption in Save the Manatee Club’s Adopt-A-Manatee® Program. Two new manatees were recently added – Gator, a winter visitor at Blue Spring State Park in Orange City, Florida, and Electra, a resident at the Ellie Schiller Homosassa Springs Wildlife State Park in Homosassa, Florida. Each person who adopts a manatee for a $25 tax-deductible donation will receive a full-color photo, biography, and adoption certificate, as well as a membership handbook and a subscription to The Manatee Zone, the Club’s official quarterly newsletter, which features updates on the adopted manatees when they are sighted. And for a $35 tax-deductible donation, each new member who joins the Adopt-A-Manatee® program also receives a 7-inch plush manatee toy. Shipping is free in the United States. Founded in 1981 by former Florida Governor and U.S. Senator Bob Graham and singer/songwriter Jimmy Buffett, Save the Manatee Club is an award-winning, international nonprofit conservation organization and the voice for manatees and their habitat. Funding from the Club’s adoption program is the cornerstone of the organization’s education and conservation efforts. Adopting a manatee for someone at Easter or for other occasions throughout the year helps with emergency rescue response for sick and injured manatees and for waterway signage, public awareness, research, advocacy, and more. Read about the Club’s work. 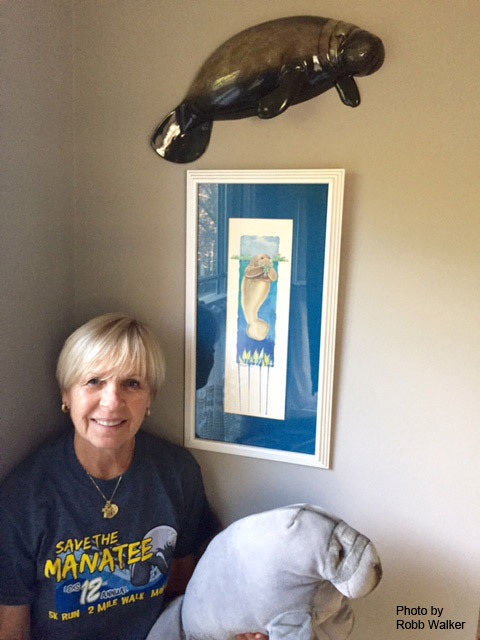 Nancy, who is a retired physical education teacher, was pleased to find another way to support the manatees she cares so much about. She participated in the Virtual Save the Manatee 5K last year and plans to run again this year. Sign up for the Virtual Run or the 5K in Michigan on May 21st at everalracemgt.com or savethemanatee5K.com. Proceeds go to Save the Manatee Club for various conservation efforts. “I think the Club is doing a fantastic service for these precious marine mammals,” said Nancy. For more information about manatees and adopting one as an Easter gift, visit Save the Manatee Club’s web site, or call 1-800-432-JOIN (5646). Also, sign up for the Club’s free enewsletter, and watch manatees in their natural habitat on the Club’s Blue Spring webcams at ManaTV.org. You can also follow the Club on Facebook or Twitter.